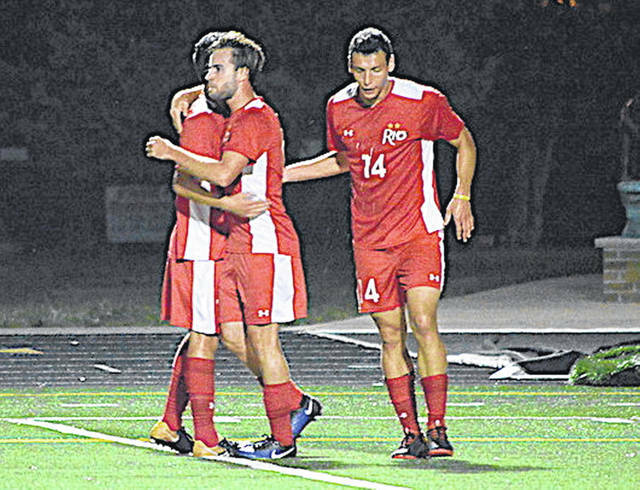 Rio Grande’s Eduardo Zurita is congratulated by teammates after his second half goal in Friday night’s 3-0 win at Saint Xavier University. CHICAGO, Ill. – The University of Rio Grande opened its 2018 men’s soccer season in successful fashion Friday night, posting a 3-0 win over Saint Xavier University at Deaton Field. The RedStorm, who entered the contest ranked No. 16 in the preseason NAIA coaches’ poll, outshot the host Cougars, 13-5, and allowed only two shots on frame in the contest. Rio Grande scored what proved to be the only goal it would need with a little more than 21 minutes gone in the opening half when sophomore Samuel Pederson (Aldershot, England) found the back of the net off a crossing pass from junior James Williamson (San Jose, Costa Rica). The lead reached 2-0 with 6:41 remaining before the intermission when freshman Nicolas Cam Orellana (Santiago, Chile) broke free on a dribble inside the right side of the box and pushed a shot past SXU net-minder Shane Badertscher. The RedStorm’s final marker of the night came just over 12 minutes into the second half when senior Harry Reilly (Coventry, England) lofted a crossing pass from 25 yards out on the right wing and fellow senior Eduardo Zurita (Sant Boi de Llobregat, Spain) scored on a nifty one-timer. Rio junior goalkeeper Richard Dearle (Castle Donington, England) recorded a pair of stops in his debut en route to a clean sheet effort. Badertscher stopped four shots in a losing cause for the Cougars. Benjamin Andoh snapped a scoreless tie with a goal just over 13 minutes into the second half and lifted the University of Rio Grande to a 1-0 win over Roosevelt University, Sunday afternoon, in non-conference men’s soccer action at Toyota Park. The RedStorm improved to 2-0 with the victory. The loss came in the 2018 season opener for the Lakers. The match was a defensive struggle from the outset and featured just nine shots on goal combined – six by Rio Grande and three by Roosevelt. Andoh, a sophomore from Glasgow, Scotland, netted the game’s lone marker at the 58:16 mark of the contest off a feed from senior Eduardo Zurita (Sant Boi de Llobregat, Spain). The Lakers, who were outshot 10-7 overall, managed just one shot on frame after the RedStorm’s go-ahead goal and that came 52 seconds after Andoh’s score. Freshman Simon Grande (Ontario, Canada) had three saves in the shutout effort – his first career appearance in goal for Rio Grande. Jesus Velasco had five saves in a losing cause for Roosevelt. Rio Grande returns to action on Saturday, entertaining Indiana Tech in its home opener at Evan E. Davis Field.